Are we not done with James Franco yet? I mean, whatever, he was fine in Spiderman and probably was okay in that 128 Hours movie that I refused to see because I am overly sensitive to gross and/or violent things, but come on. He does 8 million things at a time which only serves to solidify his identity as a jack of all trades, master of none. Is anyone really like, "yeah man, I really just love James Franco. He's totally an artist on screen"? No. Does he just keep churning out nonsense day after day because he knows it's not working and just can't bare to stop for five minutes and channel all his efforts into one thing that would actually be worthwhile? Not exactly the best approach, there, James. Come to think of it, James could use a swift kick in the pants from Ron Swanson. As could most people in hollywood. But I digress. Most recently I have discovered his disturbing teddy bear "art," which was terrible enough on its own, but this week I unfortunately ALSO stumbled upon a music video he directed for R.E.M. starring...wait for it...Lindsay Lohan. Doesn't it just make you want to punch him in the face? He really is the worst. I think he has become the James Franco of 30 Rock. At least he has in my head. 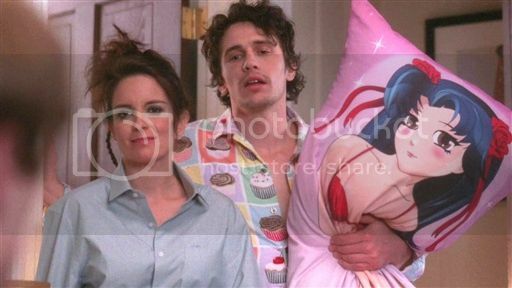 You don't know he doesn't have a Japanese body pillow girlfriend, ok? To save you some time, the video is basically a trippy five minutes filled with overlaid shots of the seedy underbelly of L.A. and Lindsey Lohan does what she does best, poses provocatively while someone takes pictures of her. Also she wears hipster glasses for about 3.5 seconds and then (for once) comes to her senses and takes them off. James Franco looks all artsy with old-timey cameras and takes some polaroids. End scene. Combined with the song, it's equal parts annoying and depressing. Can't you just picture Lindsay and James just sitting there in director's chairs smoking something unmentionable and watching the final cut on a monitor, nodding to each other and pontificating about how this video is totally a reflection on society and how everyone should just really quit judging everyone because we don't know their lives, you know? And really, R.E.M.? Is the mid-size club scene most 90's alt bands are playing nowadays just so unbearable that you had to align yourselves with this nonsense? I believed in you. As I do nearly all 90's alt bands. And you let me down. Don't make me say it, okay? Don't make me say it. Fine, you've left me no choice. It's the end of the world as we know it. Can we just give James the ol' hook and drag him off the proverbial stage already? Just send Ron in after him. Like anyone would even be mad. Ron Swanson: "Alright son, that's enough out of you." James Franco: "But..I just have one more act where I set a dollhouse on fire and perform on aerial silks and call it performance art and then I release the whole thing as an interactive documentary!" Ron Swanson: "Exactly." You know what? I propose we send Ron Swanson in whenever any celebrity becomes a particular nuisance to society. Who do you think Ron should go after next?